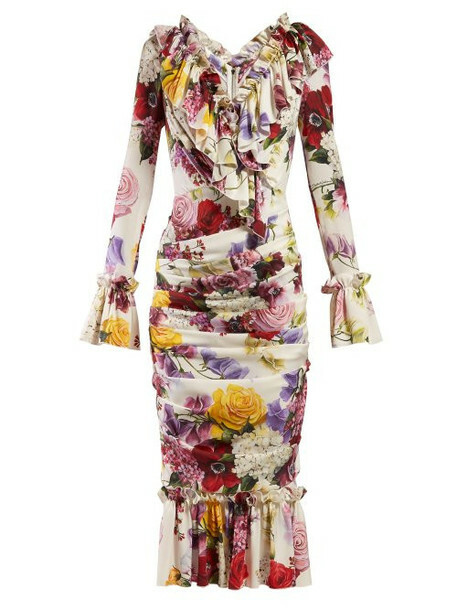 Dolce & Gabbana - The cascading ruffles trimming Dolce & Gabbana's white Hortensia-print crepe dress lend it an endlessly feminine feel. It's crafted to a slender silhouette with a charming gathered hem panel which mirrors the fluted cuffs, then ruched at the side seams to create soft folds across the body. Style it with a structured bag and blush-pink stilettos to maintain the romantic air.